It may seem as though it’s the tenant that has all the legal rights on their side if you become a landlord, but in fact you have several legal rights as a landlord, and if the tenant does not respect those rights then you could have a right to take certain legal action against them. It sounds obvious and should go without saying, but if you are a landlord renting out your property, you are entitled to receive a reasonable amount of rent from your tenant on an agreed basis and at agreed periods, for letting the property. If your tenant ups and leaves your property and doesn’t give you the proper amount of notice (this should be set out in the tenancy agreement) you are legally entitled to charge them rent for either the amount of time that was left on the tenancy agreement, or for the notice period, usually whichever is the shorter. If tenants miss rent payments, and you can’t get them to come to an agreement to pay the rent amicably, you can go to the court and issue possession proceedings - if the rent is more than 14 days overdue. You can also start possession proceedings if the tenant is in breach of any of the terms of the tenancy or if they become bankrupt, or enter into a voluntary arrangement with their creditors. If you need to get access to the property while it’s being let, either you or your agent is allowed access to the property for two reasons. To carry out property inspections It’s your legal right to keep an eye on the property and make sure that it’s being kept in a good state of repair, and that the tenants appear to be abiding by their tenancy agreement. If you need to gain access to the property for this reason, you must give the tenant at least 24 hours notice, in writing. To show prospective tenants around the property It’s usual to put a clause in the tenancy agreement that says you, as a landlord, or your agent, have the right to gain access to the property at a reasonable time, to show any prospective new tenants around, if your current tenant will not be renewing the tenancy. You’ll be expected to give the tenant notice of any appointments; this should be at least 24 hours. When you let a property, the tenants are legally obliged to make sure that they look after both the property and its contents and they are expected to maintain it by carrying out any small maintenance jobs like keeping windows clean. Any specific maintenance issues should be set out in the tenancy agreement. If a tenant damages any of the furniture or fittings provided in your property, you should be informed so that you can agree with the tenant about how the repairs or any replacements should be organised. You could be entitled to cover the costs from the tenant’s deposit to cover the cost of any damage. If the tenant has caused substantial damage to your property or they are abusing it in any way, you could be entitled to evict them. You are also entitled to dispose of any of the tenant’s property that is left at the property, after a period of time. @landlord - it happened to me. Had a dreadful tenant that refused to leave. My consolation was that the boiler broke (the tenant actually had the cheek to ask me to come and fix it, even after not paying rent for four months). I refused and thankfully because it was mid-winter she eventually left. @landlord - unfortunately this is never an easy situation to find yourself in. Have a look at our partner site: Ending a Tenancy link here . It says if you have a problem tenant, and they won’t leave your property voluntarily, all you can do is take the matter up through the courts and try to legally recover possession of the property. If you get a court order for possession, and then have to follow this up with the threat of bailiffs (or indeed have to send them round to change the locks) you can’t be accused of unlawful eviction or harassment. 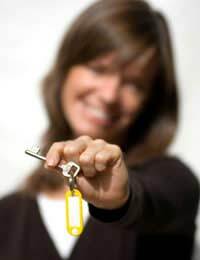 Once a tenant has been given the keys and moves in, you lose control over the property unless you get the court order for possession which can take several months. Good luck. My tenants have given notice to quit the house I'm renting to them, however, they are now being very awkward about potential new tenants viewing the property.They insist on 24 hours notice which is their right, however, they are refusing entry between 12 and 3 every day and after 6pm which rules out anyone working viewing the property in a lunchbreak or after work. They have also cancelled Saturday viewings saying their daughter is ill (which obviously understandable if that's the case) They are not returning calls to the agent so they cannot ascertain when they can gain access.The place is also a tip which has put the few people who have been in, off. Do I have any rights?They may be within the letter of the law but it seems extremely inflexible and I fear they will continue this behaviour for another month until they leave leaving me with a rental shortfall until I re-let. I haven't had any problems with them before and thought we had a good relationship so I am at a loss to understand their unreasonable behaviour.